The number of beneficiaries of the Supplemental Nutrition Assistance Program (SNAP), otherwise known as food stamps, has exceeded 45 million for 50 straight months, according to data released by the Department of Agriculture (USDA). In June 2015, the latest month for which data is available, there were 45,510,153 beneficiaries of the food stamp program, an increase of 14,869 between May and June. Beneficiaries of this program now exceed the population of Canada, which totals 34,834,841, according to a widely used source for such figures. In June 2015, households on food stamps received an average benefit of $256.05, and total benefits for the month cost taxpayers $5.7 billion. In addition to the number of beneficiaries, participation for households also increased in June. 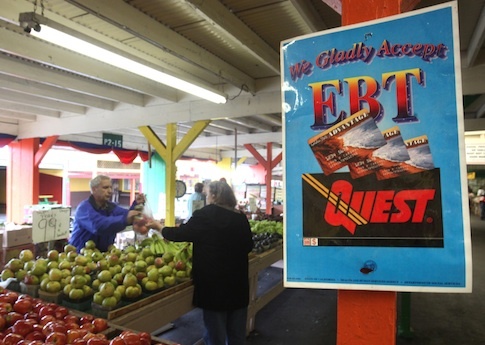 There were 20,321 more households enrolled in food stamps in June than there were in May. The USDA has been tracking data on SNAP participation since fiscal year 1969, at which time average participation stood at about 2,800,000. Average participation in fiscal year 2014 hit about 46,500,000, meaning that since 1969 participation in the program has increased 16-fold. This entry was posted in Issues and tagged SNAP, Welfare. Bookmark the permalink.